In our second blog around getting started in private practice, Sarah Rees and Heather Howard examine website content, managing accounts, SEO (Search Engine Optimisation) and social media. When you know the audience that you want to target, then building your content becomes a lot easier – how you write your website or develop your social media channels will flow with ease. I’ve been blogging for a number of years now and my style has improved and I’ve had some training and help with this. Having written medical notes for far too many years, my style was a little dull. Not everyone has a website but we all have to get our message out there in a clear concise way. The best advice I’ve been given is that you shouldn’t have to make your audience think too much. This especially goes for our market who are often people in emotional distress – I try to be as clear as possible – I am open about my fees, have a step by step guide, maps and pictures along with car parking postcodes so people can get to me with ease. This clarity is often fed back to me by clients so I know its valued. If I just had a Facebook page and no website I would try to do the same. Less is often more with content – be clear about what you do and what you offer and how. Get a friend to read your content and simplify anything they get stuck with. If there is one thing I should never have done when setting out on my own it is doing my own bookkeeping and accounts. I do however know some therapists that do this very well and may disagree with me. We are therapists with therapist’s minds, so it makes sense to focus our energies on what we know and let other people do what they know. Get an accountant to do your tax returns and a bookkeeper to do your receipts! This will save you time and your time is money. I wasted a number of weekends with my bizarre bookkeeping process I can’t even bear to think about it. I did not have to go through this and this is my hot tip for any new therapist. Not only is having a website important, it has to also perform well on Google. This is not my area of expertise but I have picked up some SEO tips to get you started. SEO stands for search engine optimisation. It’s essentially about ensuring that your website can be found by people. If a person goes to a search engine like Google and types in a search term like ‘saucepans’ then the search engine will return what it believes are the best sites to list about ‘saucepans’. A search engine understands the best sites to list for ‘saucepans’, by reviewing all websites across the internet and finding ones that have quality content about ‘saucepans’. If a web page mentions ‘saucepans’ several times then the search engine believes this is a good site to display in the search results. The quality element is key to SEO and search engines like Google and Bing use many factors to determine what it believes are the best results for its customers. So, the better quality, high value and unique information on your website, the better. Another tip is to make sure that you are on Google my Business. This is where you register a business page, add a few photos and link back to your website. Make sure that you maintain it by updating the content, then Google will know your business is active and not dormant. Get registered with all local business directories and make sure your name and address is consistent across all platforms and Google will pick this up and rank you higher. Pick a couple of key terms or phrases that you think your customer will type into Google and then scatter them around your site and ask your designer to ensure these terms are optimised on your site. providing a personal touch, build your tribe and let everyone know about any projects, specialities or particular interests that you have. The main platform that I used to build my business initially was Facebook. I started off by setting up a Page that was specifically all about my business and what I offer. This is separate to my personal Facebook page, keeping my personal and professional life separate. I invited everyone I knew to ‘like’ my new page, asked them to share posts and help spread the word, which really helped. Once I got the hang of things, I then started to ‘sponsor’ (pay for) advertised posts, which I then designed specifically to share more about the services on offer and the types of mental health problems that CBT is effective for. This helps to increase your audience and build your ‘tribe’, a term that basically means a group of people who are interested in mental health and therapy and who interact with your posts. There is so much more that I could discuss around social media, but I’d suggest that if you’re new to social media as a platform to promote your business, then look out for local courses on using Twitter for Business or LinkedIn etc… Eventbrite often advertises these. 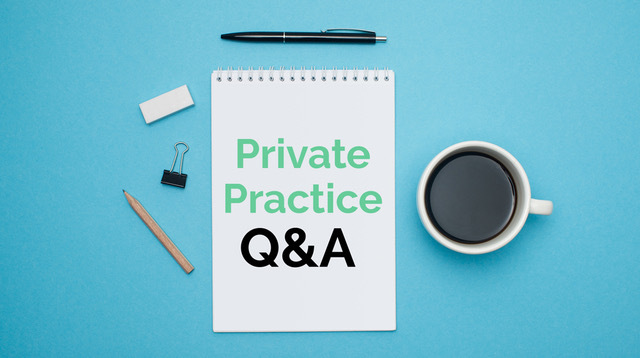 If you’d like more information on Setting Up In Private Practice then check you might find this guide useful that Sarah has put together with the IPSIG website consultant, Sophie Wood, ‘Getting Started In Private Practice Pocket Guide’. It has 40-pages of tips and advice on where to focus your efforts and how to get the best start for your therapy business based on real-life experience. The price is £25.00, but for BABCP members a £5.00 discount on this price is being offered using the coupon code IPSIGPP5.